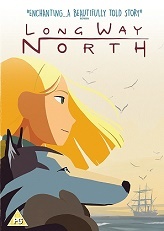 Long Way North is released on DVD October 10th And to celebrate we have a great competition for you and 2 copies on DVD to give away. The beautifully animated adventure tells the story of 15-year-old Russian aristocrat Sasha, who, when her explorer grandfather mysteriously goes missing on his latest expedition, embarks on an epic adventure to find him and his lost ship, the Davai. Stunningly rendered in traditional hand-drawn 2D animation and winner of the coveted Annecy International Animation Festival's Audience Award, the film is the directorial debut from lauded animator Rémi Chayé, and was co-produced by French studio Sacrebleu Productions and acclaimed Danish animation company Norlum (Song of the Sea). This DVD features both English and French language versions of the film.